“Refine your touch!” she said. I realized then that if my touch was harsh and I attempted to make things happen against the will of my clients and their tissue, my work would be less effective and could be a cause of alienation rather than of a rewarding and close connection. Make your sessions a journey rather than a destination and don’t become too attached to the outcome of your work. Some therapists appear to be trying to win an argument with stubborn holding patterns. Instead, consider your bodywork as a give-and-take dialogue, the outcome of which is your client’s voluntary release of pain. It is IMPORTANT to realize that your mindset can determine the quality of touch as much as your specific biomechanical techniques. As stated above, probably the single most common scenario in which work is perceived as overly intense is when a therapist works too quickly. Quick work is often attempted by therapists with a generous sense of urgency to get too much work done or who cling to routines that emphasize covering the whole body with equal attention to all parts. Such routines can cause therapists to spend unneeded time on relaxed areas and to rush on areas of holding. Many therapists report fear of clients feeling short-changed if they don’t perform a full-body massage. Although educating clients about the benefits of detailed spot work is very helpful, it is also possible to have the best of both worlds by simply educating clients on the advantages of longer massages. Longer massages leave enough time for the client to unravel holding patterns, while still covering the entire body with varying degrees of focus in areas of need. Related to this point is an overemphasis on warming tissue up. Of course we don’t want to just dive in, but I often see therapists warming up tissue that is superficial to actual tightness. For example, some therapists spend inordinate amounts of time working on the gluteal muscles when the actual tightness is in the deeper rotators; working on the gastrocnemius when the soleus is the problem; or warming up the pectoralis major when the tightness is in the pectoralis minor. Some practitioners spend excessive time on the external abdominals and then dive in too quickly to address the psoas, which is a totally different muscle and layer of the body. The ultimate key to a successful session is to slowly sink to the layer of the body until you meet a resistance barrier. Typically, these deep myofascial compartments of tension release best when approached at an oblique angle. As resistance is met and the tissue begins pushing back at you, simply meet the resistance and slowly work through the adhesive area. The superficial layers will also benefit, even though your intent is focused at the deeper motion-restricted tissues. By the same token, don’t be too attached to mechanical long strokes, each performed with the same speed and pressure. 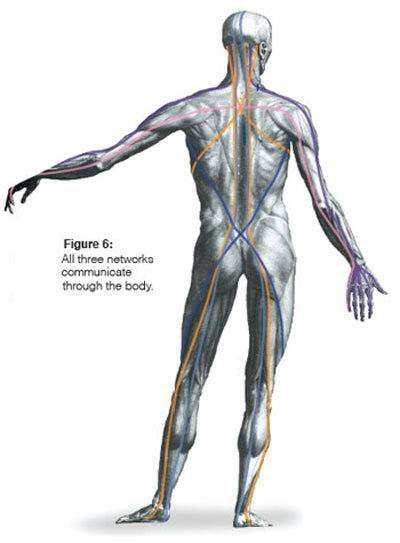 Individual muscles have great variation in where their restrictions lie. So that you can slow down and do focused repeat strokes in isolated areas of tightness, move quickly along long muscles like the hamstrings, quadriceps, and erectors, as well as relaxed SECTIONS of the calf, arms, and IT band. Turning your client on his side enables you to have proper mechanical advantage with your body weight and the ability to WATCH his face for reactions to particularly sensitive areas in the IT band, which may need extra attention. Use very little lubrication, so you won’t have to apply too much vertical pressure to grab tissue; too much lubrication will cause you to slide over the tissue as you try to hold it. Elongate and even rotate the lateral compartment in an anterior or posterior direction to promote proper tracking of the knee and hip.